Jade Harmony, X-long & Wide, Travel, two tone, special edition & Pro 3/16"
Natural open cell rubber from the Far East, one of Earth’s most amazing natural resources. 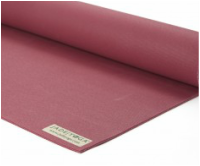 Say goodbye to slipping on your mat, even if it gets wet from perspiration, with the best slip-resistance on the market. Plus Jade plants a tree for every mat sold.